Sweden joined the EU only in 1995 and a year later also became part of the Schengen area. However, it is one of the six EU countries that are not part of NATO and it also refuses to join the eurozone, following a referendum in 2003, in which people voted against adopting the common currency. This has resulted in a de-facto opt-out. Sweden has a population of 10,2 million, or around 2.2% of all EU citizens (without the UK), and will elect twenty-one (3%) out of the 705 members of the European Parliament (MEP) 2019-2023. At the European Parliament (EP) election in 2014, the turnout in Sweden was 51.1%, above the EU average of 42.6%. Recent polls show that most Swedes believe the EU is a good thing (77%) rather than a bad thing (16%), which is well above the EU average (62/11%). In addition, 82% feel like EU citizens, which is one of the highest scores. However, this contrasts with just 29% support for adopting the euro. Sweden has a strong economy, confirmed by the European Commission’s (EC) latest autumn and winter forecasts that expect continued economic growth, although without the momentum of recent years. Between 2014 and 2018, it grew 2.8% on average annually (real GDP), which is slightly above the EU average (2.1%). It is expected to expand 1.3% in 2019, which is below the EU average (1.5%). Sweden’s economic strength is confirmed by economic indicators. Its total GDP was €475.2 billion in 2017, around 3.6% of total EU27 GDP. Moreover, Sweden recorded a real GDP per capita of €42,800 in 2017, well above the EU28 average (€27,700). In purchasing power standards (PPS), Sweden’s per capita GDP corresponds to 121% of the EU28 average. The unemployment rate was 6.3% in 2018 and is expected to remain stable at 6.2% by 2020, close to the EU28 average of 7% (2018) and 6.3% (2020). Youth unemployment, however, stood at 16.8% in 2018, above the EU28 average of 15.6%. Sweden is a constitutional monarchy with a unicameral parliament. Its most important politician is the prime minister who is the head of government. The head of state is the monarch (currently King Carl XVI Gustaf), who has a ceremonial and symbolic role. Sweden was one of the main destination countries during the migrant crisis (and the largest receiver of asylum seekers per capita globally in 2015). Migration and integration issues have dominated the political scene in recent years. The support for the anti-immigration far-right Sweden Democrats (SD), who were elected into the national parliament for the first time in 2010, has since increased considerably. This has challenged the entire party system, traditionally made up of a right-wing and a left-wing block. Following the 2014 national elections, the left-wing block gathered the most votes but did not have a majority. The SD became the third largest party. 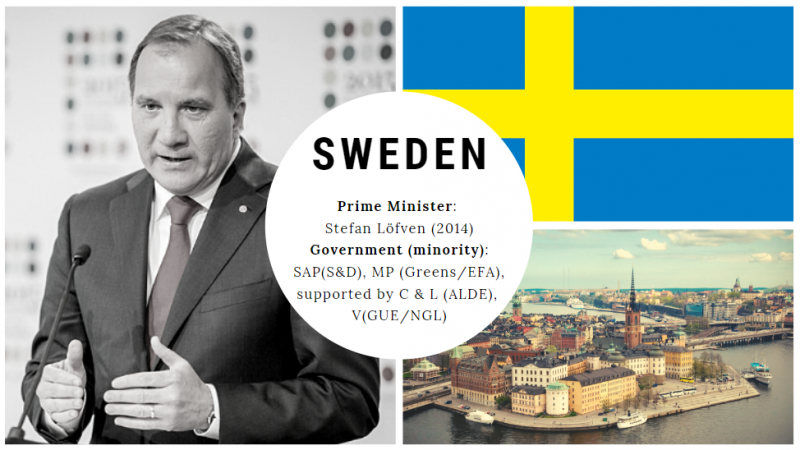 Kjell Stefan Löfven’s Social Democrats (SAP) formed a government together with the Greens (MP). In order to exclude the SD from political influence, the alliance of the four centre-right parties and the socialist Left Party (V) agreed to cooperate with the government. Although the Christian Democrats (KD) broke this agreement in 2015, the practice remained throughout the government’s term of office. While Löfven’s left-wing government, composed of the Social Democrats (SAP) and the Greens (MP), has moved in a more restrictive direction on immigration since 2015, it has not been able to stop the SD’s growing support. Neither have the parties of the centre-right alliance. On the contrary, forming a government after the 2018 national elections proved even more difficult. Both governing parties SAP and MP, as well as the centre-right M and the Liberals (L), lost support, whereas the SD’s support further increased. After four months of negotiations and two failed prime minister votes, Löfven’s second proposal was approved in January 2019 as the Centre Party (C), the Liberals (L) and Left Party (V) abstained from voting against him. Meanwhile, the centre-right alliance has eroded due to disagreement on how to tackle the ascent of the SD. The will to minimise its influence was the main reason for Centre Party and the Liberals to tolerate a second Löfven government, whereas the Moderates and the Christian Democrats (KD) would have been prepared to govern with the support of the SD votes in certain issues. While the SD has so far been prevented from having a position of power, it remains to be seen if this strategy of excluding them from power, as opposed to, for example, Denmark’s and Austria’s approach to populist parties, will further increase their support. Based on the most recent polling, which suggests an all-time high voter turnout, it is expected that Löfven’s SAP, a part of the Progressive Alliance of Socialists and Democrats (S&D), will win about 27.5% of the votes and thus end up first, gathering seven (up one) out of the total 21 Swedish EP seats. The SD, a member of the Alliance of Conservatives and Reformists in Europe (ACRE), is estimated to finish second with about 18% (a would-be record) and win four (up two) seats. The liberal-conservative M would win four seats as well. Together with the Christian democrat KD (two seats, one up) it would add six in total for the European People’s Party (EPP). The Left Party, a member of the European United Left/Nordic Green Left (GUE/NGL), will most likely win two seats (up one) whereas the Centre Party is expected to keep its only seat for the Alliance of Liberals and Democrats (ALDE). The biggest losers will be both the Feminist Initiative, that is currently far from reaching the electoral threshold, and the Liberals (at present slightly under the threshold). The Green Party (MP) is set to keep just one of its current four seats for the Greens/EFA group. Behind the Social Democrats, things will probably change a lot compared to the last election. However, 40 % of the Swedish electorate has still not decided who to vote for. Fanny Lindvall works in local administration in Germany. She holds a master’s degree in Political Science.